The history of Christmas markets goes back to the late middle ages in the German-speaking parts of Europe. The Vienna “December Market” was a forerunner of the Christmas market and dates back to 1294. The Christmas market sailings on river cruise lines generally begin in mid-to late November and continue through the end of the year. These sailings are typically held on the Main, Rhine, Danube and Seine rivers. They are perfect for those wanting to experience the quintessential magic of the holidays while shopping for one-of-a-kind treasures. One line that offers a beautiful series of Christmas Market Cruises is AmaWaterways, who invite you to leave the flurry of holiday preparation behind and instead relax aboard one of their state-of-the-art river cruise ships this holiday season. 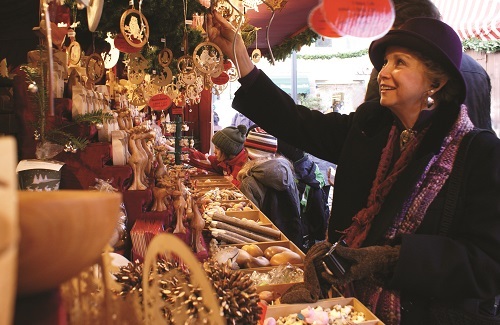 An AmaWaterways Christmas Market cruise explores Europe’s most magnificent cities and allows you to explore the famous and much-loved Christmas Markets, learning how many honored holiday traditions b egan, centuries ago.